Things get busy in the build up to Christmas but it’s a great chance to look back on a lovely year of good food, good friends, good farming, hard work, bountiful harvests, pest control and scorching summer days. Come and join us to celebrate our year of local food 2018 and to look forward to next year when we’ll do it all over again! 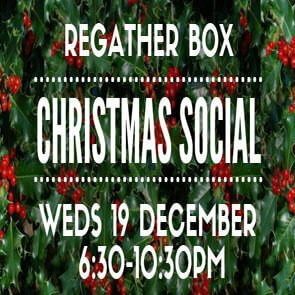 The Christmas box social night is a collaboration with the Sheffield Growers Drinks, bringing box suppliers, local producers, local farmers, allotmenters and foodies together to sup some mulled wine, beer or chai tea, nibble on snacks (provided by us) and chat with new or old friends. Please drop in and join us for a bit. This is a part of our seasonal veg box social programme; we invite all interested in Regather to join us. It’s a free event, but you should come wanting to buy a drink!